Eggnog just screams that it’s the holiday season! Eggnog cakes with pecan praline topping are also a Christmas time treat that are fun to make to give out as gifts in your holiday cookie exchanges! It’s that time again for Freaky Friday. 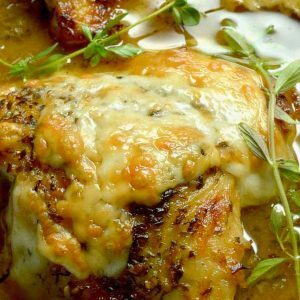 It’s the event where several other food writers do a “website exchange.” We are given a name to make a recipe from their site to share with our readers to introduce you to delicious recipes you may not have seen before. I got super lucky for this edition in getting Debi from Life Currents! We were to select recipes that we could make for a cookie, bar or candy exchange! Debi’s philosophy is similar to mine in that good things happen around the table! Good food with good company is what life is all about! Life Currents has so many sweet treats to make I had to make three different ones in trying to decide which one to share with you! Seriously, Debi has so many fun things for cookie exchanges, check out all of her delicious treats here! I’ve actually had Debi’s site before so I was excited to be able to make another recipe from her site. After my first experience making the Smoke Sauced Shrimp I knew she made food that was ah-MAY-zing! She has so many things you’ll want to make for Christmas or any time of year!! Her Oatmeal Sandwich cookies, Salted Fudge Brownies and Old Fashioned Cream Caramels’s are all so good. I made every single one of them and gave them out to family at Thanksgiving and my family raved about them! In the end though I ended up deciding on her Eggnog Cakes! When I decided to make this recipe I must admit I wasn’t a big fan of eggnog. But what they say is true.. your tastes can change. When I was mixing up the batter I couldn’t believe how nice the eggnog flavor was. Just smelling the mouthwatering aroma made me think of the holidays and all the good foods that are a part of the season. Anyway, since I hadn’t had eggnog before I had to research what it actually was. Eggnog is a drink that is really popular in the United States and Canada. 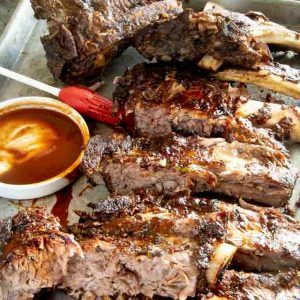 It’s typically served from Thanksgiving through New Year’s eve. It’s more often than not served cold but in recent years with so many people worried about raw eggs it’s also served warm. Eggnog can be served non-alcoholic but adding a bunch of rum or bourbon makes it even better for a cocktail party! You can make a big batch of it so you don’t have to be making drinks all night too which also makes Eggnog an excellent choice for entertaining! How do you make eggnog cakes? Butter the pans you’ll be using. Beat butter, sugar, nutmeg and salt until light and fluffy. Melt butter, brown sugar and syrup with salt until sugar dissolves. Bring to a boil until it hits soft ball stage. Pour immediately over the top. PRO TIP: When using any sticky sugary liquid and you have to measure it out. Spray the measuring cup with cooking spray just before filling the cup up. 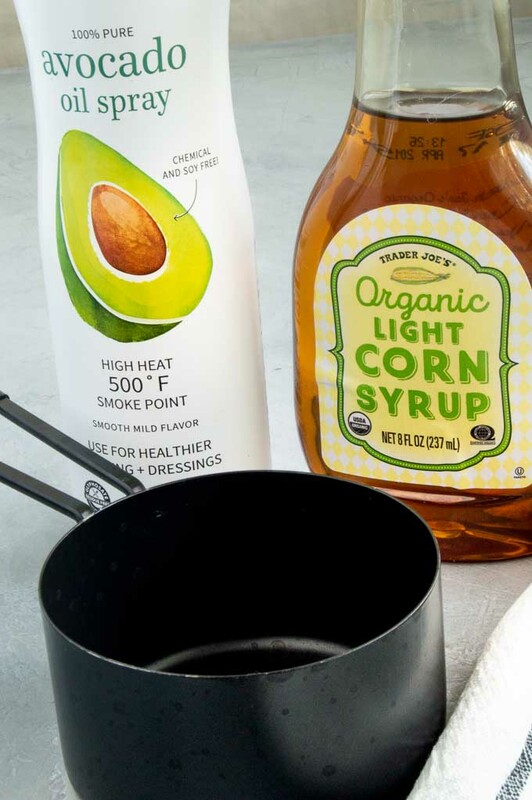 In this recipe, the corn syrup will just slide right out of your measuring cup! Can I make eggnog cake ahead? Yes, these eggnog cakes stay fresh for several days. Just cover them with plastic to keep them moist. 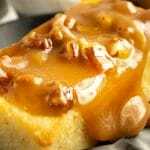 I would make the praline topping on the day you are serving them or the day you are giving them away for maximum freshness! 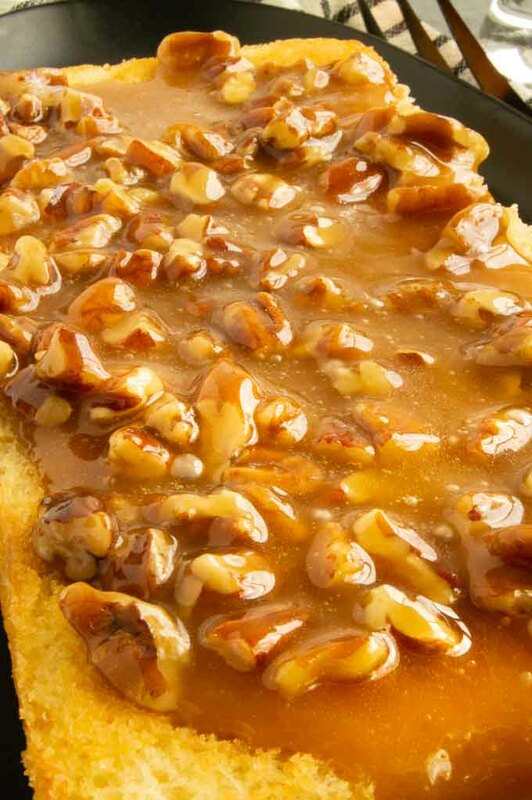 What is soft ball when talking about praline topping? Soft ball temperature is when the melted sugar mixture is between 235°-245° Use a special candy thermometer to test the temperature. What if I don’t have a candy thermometer to test it? As a last resort you can prepare a bowl of iced water and drop a small amount into the water if it forms a small ball and remains soft and malleable it is at soft ball temp. Its easy to make an error this way unless you make candy often so I highly recommend getting a thermometer ! I don’t drink alcohol, do I have to put rum or whiskey in the praline topping? You can make the praline topping with a rum extract (1/2 teaspoon) or you can leave it out completely. 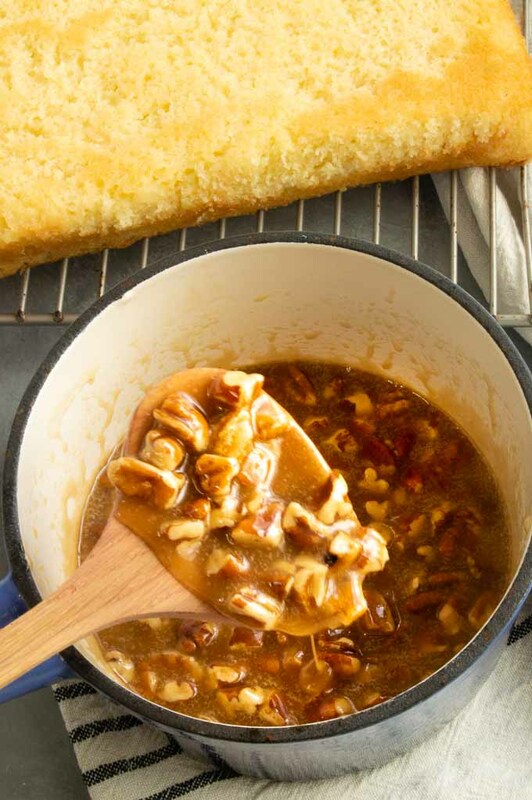 Can I use a different nut instead of pecans? Yes any nut you want to use for the praline topping will work. I suggest using walnuts or chopped almonds if you prefer them over pecans! More Food Gifts to make this holiday season! 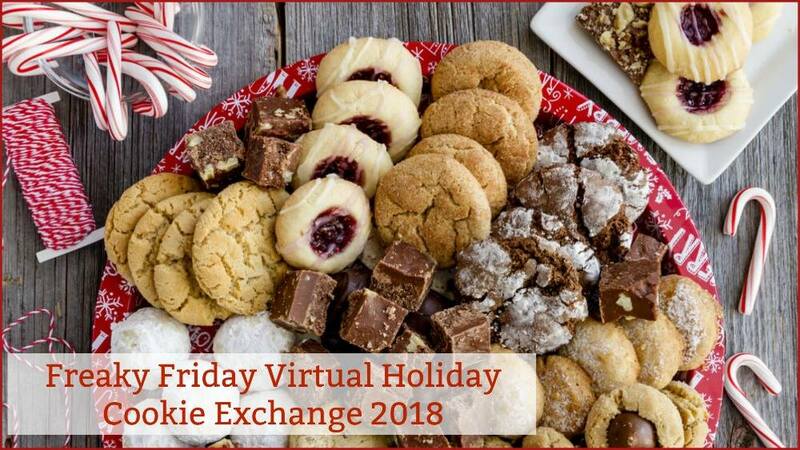 BE SURE AND CHECK OUT THESE OTHER HOLIDAY COOKIE EXCHANGE RECIPE IDEAS! Mini Eggnog Cakes will be everyone's favorite food gifts this Christmas! Slightly sweet, moist eggnog flavored cake that's light and delicious. 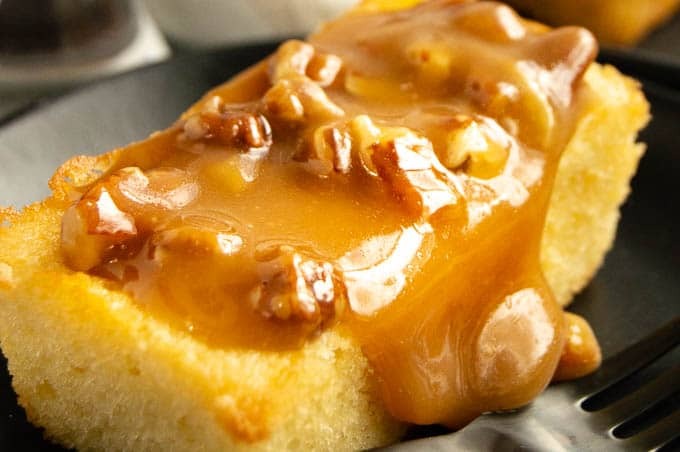 Topped with homemade pecan praline topping to make a perfect treat. Preheat the oven to 350°F, and grease the pan(s) of your choice: a large (10") tube or bundt-style pan; six small loaf pans (about 3 1/2" x 7"); 12 mini oaf pans (4.5 in. x 2.5 in.or two 8 1/2" x 4 1/2) loaf pans. 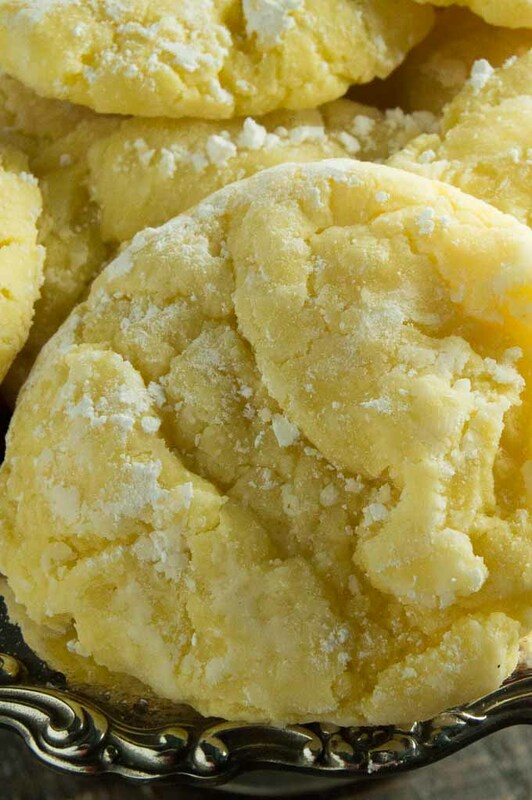 Batter: Beat the butter, sugar, nutmeg, and salt until light and fluffy. Add the eggs one at a time, beating well after each addition. Whisk the flour and baking powder together, and add to batter alternately with the eggnog, 1/3 at a time, beating well after each addition. Bake 25 to 35 minutes for the small loaf pans, or 60 to 65 minutes for the large loaves or tube pan, or until a cake tester inserted into the center of the cake comes out clean. Let the cake cool in the pan for 15 minutes, turn it out onto a rack set atop parchment, to catch any drips. Topping: Melt the butter, and stir in the brown sugar, corn syrup and salt, stirring until the sugar dissolves. Bring the mixture to a boil, and continue to boil for several minutes, until it reaches 240°F (soft ball stage) on a candy or instant-read thermometer. 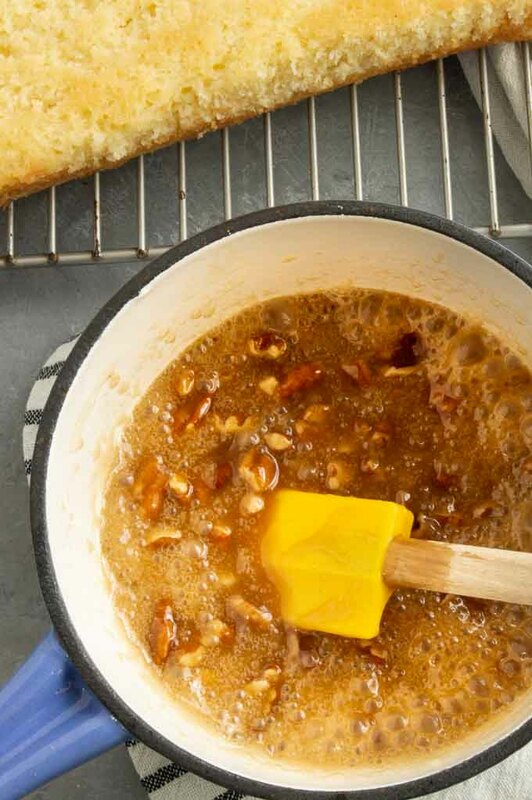 Add the rum/whiskey/bourbon and nuts, and pour the toffee topping over the cake. Cool completely before serving. 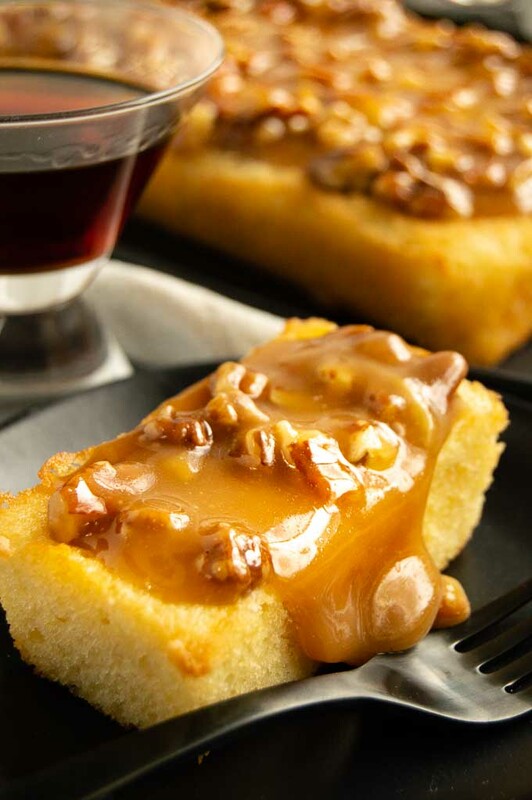 Add the rum/whiskey/bourbon and nuts, and pour the toffee topping over the cake. Cool completely before serving. These are really good! I love the traditional flavors! Positively dreamy these are!! Made a batch for a friends house and everyone loved them! 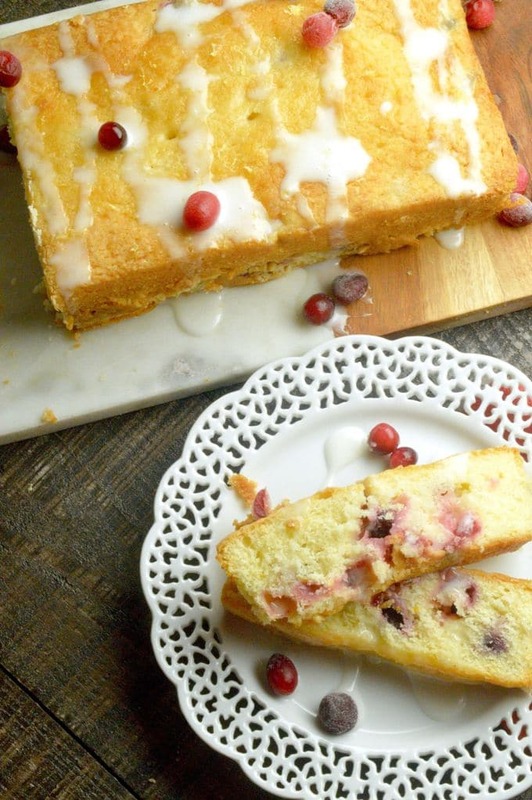 There’s so much to love with this Eggnog Cake! What a great recipe for the entire holiday season! Everything about these mini cakes has me drooling!! Oh my, especially that topping! Great recipe- my family is going to LOVE it! I can totally see why you decided on these eggnog cakes! I could eat the cakes all by themselves but that whiskey praline sauce just takes the cake! Literally!! I’m all of this cake! I absolutely love eggnog and the topping just takes this dessert over the top! I definitely need to serve up this round of goodness. It looks unbelievably decadent. What a treat! 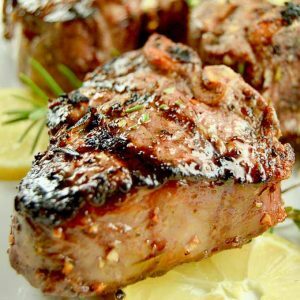 This is perfect for the holiday season, a lovely recipe!!! These cakes sound so amazing! I love eggnog! You are so sweet. I’m so happy that you got my blog for this exchange. And, I’m happy that you chose these eggnog cakes. 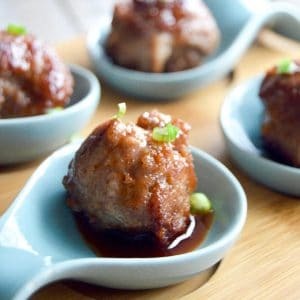 I haven’t made them in years, but they look so good on your blog that I need to make them again! Merry Christmas to you and yours! And thanks for being a great bloggy friend! I love eggnog especially as an adult so I can spike it! 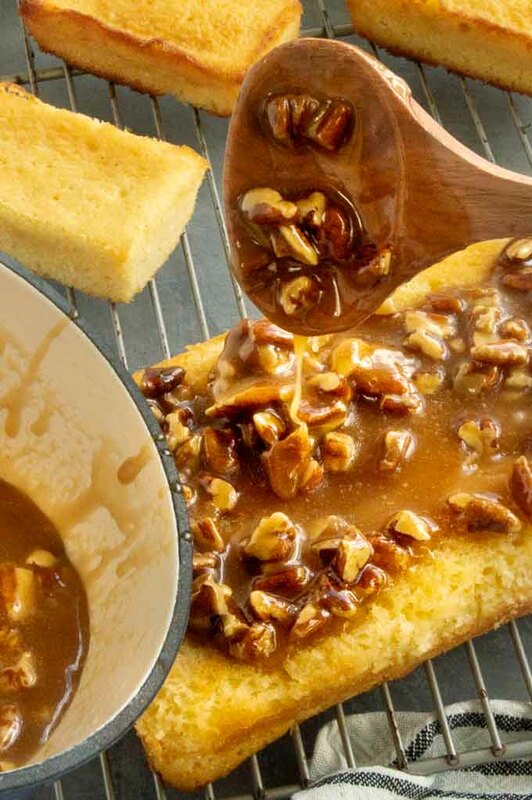 This version with the praline looks ooey gooey amazing and I’ll definitely be adding a little bourbon to mine! Ooooh, I’m so excited to have another recipe to use my eggnog in. I don’t drink it often, but I sure love baking with it. That boozy sauce looks amazing. Perfect for a dinner party too! This is such a delicious combination of ingredients that aren’t often found together; definitely, a holiday recipe whose time has come!